Made In U.S.A. By Paul N. Gardner Co., Inc. Weight per Gallon Cups are used to quickly and accurately determine the weight per gallon, and also the specific gravity of paints, lacquer, pastes, semi-pastes, and other liquid or semi-liquid materials. 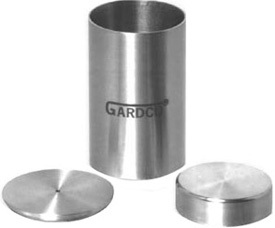 Until the middle of 1989, GARDCO weight per gallon cups were fabricated using Series 300 Stainless Steel for the sidewall and the easier machined but less corrosion resistant Series 400 Stainless Steel for the base and cover. Now, with the installation of state-of-the-art computer controlled metal cutting machinery, these cups are machined from Series 300 Stainless Steel solid bar stock. All surfaces are produced to a surface finish better than 32 RMS. Internal corners are rounded to a radius of no less than 0.188." Volume tolerance is within ± 0.5% of correct theoretical value. Volume certification qualifying under ANSI/NCSL Z540-1 or MIL-STD-45662A, as applicable, and conforming to ISO 9000 is available. 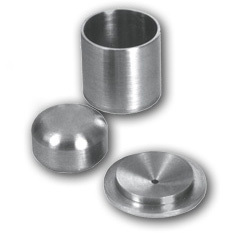 Tare weights are Series 300 Stainless Steel, adjusted to within 0.2 gram of cup weight and sized for air cushioning when dropped into the cup for storage. As a quality control check, errors in composition of a paint will usually be indicated by variations in the weight per gallon value. In normal use in the Paint Industry, many specifications will allow a tolerance of about 0.2 pounds per gallon. Any deviation that is larger than this would make the paint suspect regarding the proper amount of ingredients in the batch. Determine the weight of a clean cup in grams. As an alternative, the cup may be supplied with an accurate tare weight for use with two-pan laboratory balances. Note: Do not interchange tare weights between cups as each cup and tare weight is matched. Remove cover and fill to within 1.7mm of rim with material to be tested. Carefully replace cover so that the air and excess material is expelled through vent. Wipe over cover to remove surplus and reweigh. By subtracting the original weight of the cup, the weight of the contents will be found. If a tare weight was used at the start, the balance will show the weight of the contents. Clean thoroughly immediately after use. By comparing a water sample at a temperature listed in the chart below verification of cup accuracy can be determined. by 83.400 which equals 0.9977. Multiply all readings by this factor of 0.9977. 13th Edition Paint Testing Manual by Gardner/Sward, Part 3, Physical Properties Chapter 3.1, Sect. 3.1.3 Weight Per Gallon. (A.S.T.M., 1916 Race St., Phila., PA 19103). FTMS 141c, Method 4183 “Specific Gravity of Solvents and Thinners”. FTMS 141c, Method 4184.1 “Weight Per Gallon”. ASTM D333 “Testing Clear Lacquers and Lacquer Enamels”. ASTM D1475 “Density of Paint, Varnish, Lacquer and Related Products”. ASTM D2205 “Traffic Paints, Recommended Practices for Testing”. ASTM D2614 “Hiding Power of Chromatic Paints”. ASTM D 2805 “Hiding Power of Paints”. ASTM D 244 “Emulsified Asphalts”, ASTM D1875 “Density of Adhesives in Fluid Form”, ASTM D1875 “Standard Test Method for Density of Adhesives in Fluid Form”. There are numerous grades of Stainless Steel and all of them will corrode under adverse environmental conditions. A common type of Stainless Steel is the 300 Series which is most usually produced in sheets for forming into vats, kettles and the like. This series is highly resistant to corrosion under normal use conditions. It is very difficult, however, to machine this type where close tolerance and smoothness of finish are requirements. 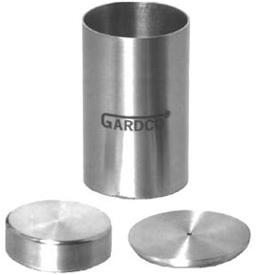 Prior to the middle of 1989, Gardco weight per gallon cups were fabricated, using Series 300 Stainless Steel for the sidewall and the more easily machined, but less corrosion resistant, Series 400 Stainless Steel for the base and cover. 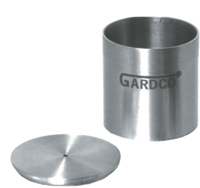 Since then, with the installation of state of the art computer controlled metal cutting machinery, all Gardco weight per gallon cups are machined from Series 300 Stainless Steel solid bar stock. 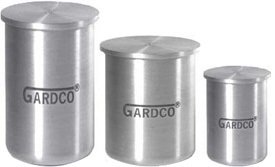 With the exception of a daily cleaning, Gardco weight per gallon cups are essentially maintenance free If it is expected that a cup will be stored for an extended period of time, it is recommended that it be given a light coating of protective oil. With only these precautions, the cup should provide long and satisfactory service and retain its original attractive appearance. - The information contained herein, or supplied by us or on our behalf in any other manner, is based on data obtained by our own research and is considered accurate. However, NO WARRANTY IS EXPRESSED OR IMPLIED REGARDING THE ACCURACY OF THESE DATA, THE RESULTS TO BE OBTAINED FROM THE USE THEREOF. This information is furnished upon the condition that the person receiving it shall make his own tests to determine the suitability thereof for his particular purpose. Weight: Cup with Cover, approximately 130 grams. US Standard Weight Per Gallon Cup with cover and tare 83.205 grams. Check out the Weigh-To-Go Kit, a weight per gallon cup field kit with included balance and calibration check weight. Weight: Cup with Cover, approximately 39 grams. Mini Weight Per Gallon Cup with cover and tare 8.321 grams. Weight: Cup with Cover, approximately 143 grams. Specific gravity = Gram Weight of Cup Contents x 0.01001. Machined from solid stock, this extremely lightweight cup (less than 50 grams) is formed from high-tensile aluminum 6000 series alloy which combined with alodined coating provides great strength with lightness. Even when filled with a heavy pigment paint the total weight is well within the capacity of a 250 gram laboratory balance. Dimensions of the 83.2 cup are approximately 45 cm. wide by 57 cm. high. WG-CERT Certification for Weight Per Gallon Cup traceable to N.I.S.T - (call for additional cost) add $160.00 to price and a /C to item number.